Wolves are starting to become one of the biggest enigmas in the Premier League. Strong and willing throughout three-quarters of the season, they’ve now hit a real stumbling block. And if anything summed up their recent slump it was Nuno Santo storming out of a press conference after being questioned about the club’s away form. It’s now five matches in a row on the road that the Midlands club have failed to win and after a Wembley defeat, things are going from bad to worse. If their team’s overall form is a concern then the recent performances of Liverpool target Ruben Neves should be too. Considering his ability and the first impression he made in the opening months of the Premier League season, it’s strange to see him doing badly. The quality is clearly there and at the age of 22, there is plenty more to come from the Portuguese. However, he’s starting to show why he may not be as indispensable as originally imagined. 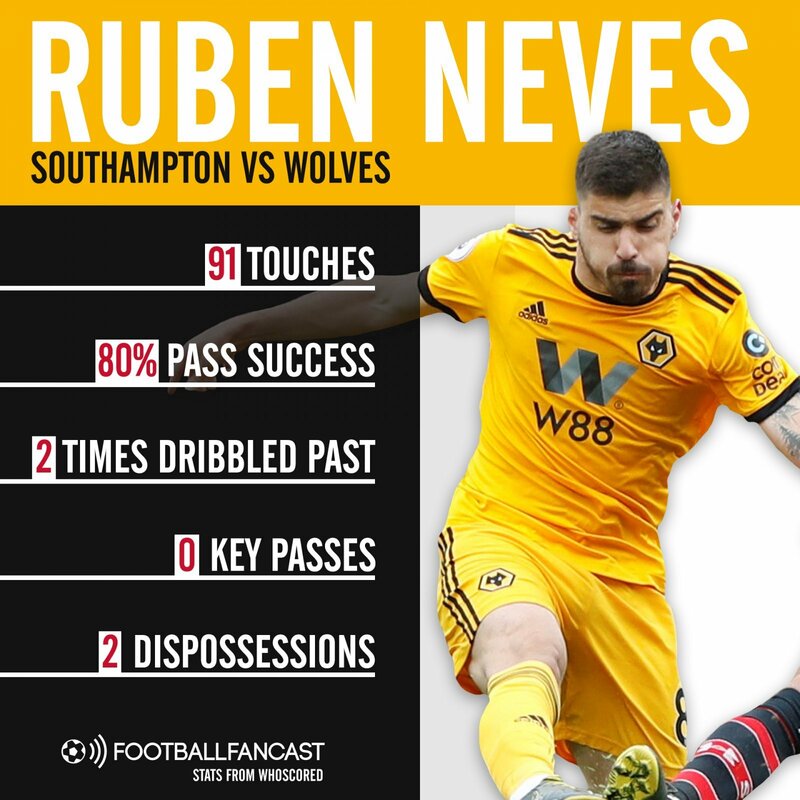 Neves was marked out of the game against Watford in the FA Cup semi-final and was then dragged off after 69 minutes of Wolves’ defeat to Southampton last Saturday. The defence was particularly poor with Romain Saiss run ragged by Nathan Redmond. Willy Boly was meanwhile constantly outdone by the clever movement of Danny Ings and Shane Long, too. However, in the middle of the park, Neves looked very out of sorts which continues along with a trend of a number of poor showings in recent weeks. His pass success was still solid but his poor afternoon was capped off by being dispossessed twice. It was hugely uncharacteristic for a player who usually keeps the ball so well. It was a lightweight display evident in the fact he was dribbled past on more than one occasion, whilst a lack of key passes will be of huge concern too. Leander Dendoncker and Joao Moutinho appear to be outperforming him at the minute and even in defeat that was all too clear. At the moment, Wolves may actually benefit from moving the player on whilst his stock is high.